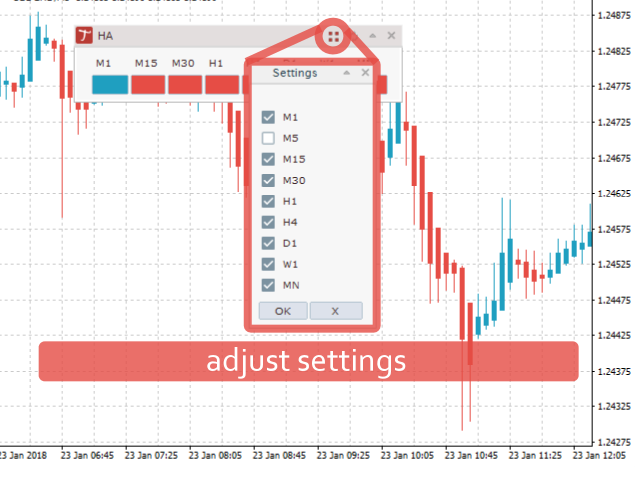 Tipu Heikin-Ashi Panel is the modified version of the original Heiken Ashi indicator published by MetaQuotes here. A professional version of this indicator is available here. 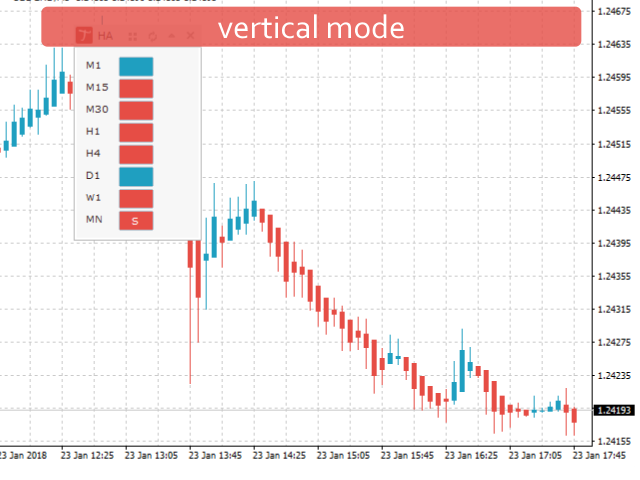 An easy to use Panel that shows the Heiken Ashi trend of selected timeframe. Heikin means "the average", and Ashi means "foot" in Japanese. Heikin-Ashi is the Japanese charting technique that uses averages of prices for plotting candles. This technique smooths some noise in the candle charts in effort to give a better trend picture. Another example of a common smoothing indicator is moving averages, that can be used in conjunction with Heikin-Ashi. The blue candles mean uptrend, and the red candles mean downtrend. For example, if a pertinent period is upward, the panel will show blue color for that period. It will also display a visual "buy" signal after a change of candle from red to blue. As a best practice, it is recommended to consider signals from other timeframes and/or other indicators before making a trade decision. Dialog Mode - Vertical/Horizontal - e.g. horizontal puts time frames horizontal. Overlay Indicator - Choose this if you want Heikin Ashi on top of your personal Candlechart, Bar Chart, or Line Chart. Thanks. Good Heikin Ashi indicator. excellent product!! Works like a charm with Tipu Trend. Keep up the good work Kaleem! Improved UI, the period settings are now controlled by the dialogue directly. Added support for horizontal panel. Reduced margins for more space. Fixed conflict with trade levels. Fixed issue with loading chart templates. The panel was crashing on loading custom user template. Fixed false buy signal on the panel caused by missing symbol history. After this update, if you continue to see false buy signals, please download history for the symbol (Tools --&gt; History Center).